We are highly active in manufacturing and supplying best quality Definite Purpose Contactors. These Contractors are used for control of motors, Power supplies, Heating equipment, Lighting HVAC Fans and compressors. Our offered contactors are designed and fabricated by diligent professionals using latest tools and techniques in various configurations. In addition to this, with our adamant approach in attaining maximum quality have garnered us vast clientele base to serve. 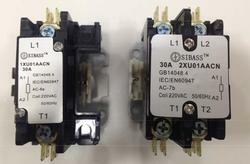 Looking for Definite Purpose Contactors ?